Full Day camp is for girls going into 2nd through 5th grade and costs $310 for the week, 10:00-3:00. The morning is reserved for choir rehearsal where musicianship is integrated into the lessons. 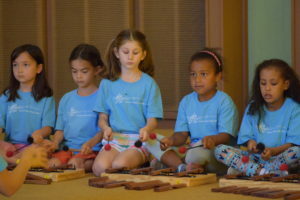 In the afternoon girls learn folk dances, participate in an Orff percussion ensemble, play songs with hand chimes, crafts and more! costs $165 for the week, 9:30-noon. 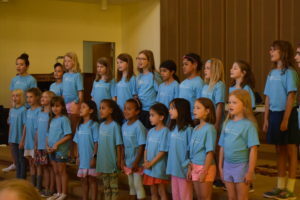 During the week campers learn songs, play singing games, explore classroom instruments, and participate in musical story-telling activities focused around a fun theme. 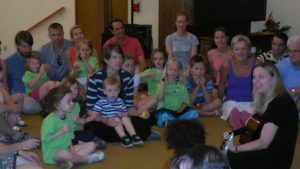 On Friday of each week the campers will perform an informal concert for parents and friends, showcasing the many musical skills learned. We look forward to meeting your camper this summer! Be sure to get a spot by registering today. You may register by printing and mailing in the following pdf form: Day Camp Registration or by filling out the on-line registration below. When using the online form payment is made at the end using PayPal (no account necessary). Camps are held at the SGC Choir Center located in the Volunteer Park SDA Church, 1300 E. Aloha, in North Capitol Hill.